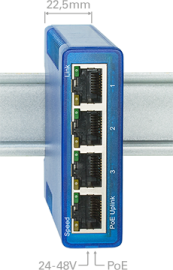 The compact Industry-Switch connects up to four network components in the control cabinet. The Switch itself is powered via PoE or with 24-48V and can also power the connected components using PoE injection or a voltage output (PoE extraction). A nearly full control cabinet and you still have 2-3 more network terminal devices to connect? The compact, 22mm wide switch is ideal for networking Com-Servers, Web-IOs, Web-Thermographs, USB Servers or other Ethernet terminal devices. The additional power output provides up to 500mA at 24V. This means for example a non-PoE network camera can be integrated into a PoE network without the need for an additional external power supply. Please order power supplies as separate accessories. Use as a PoE Injector possible only with 48V DC power supply.